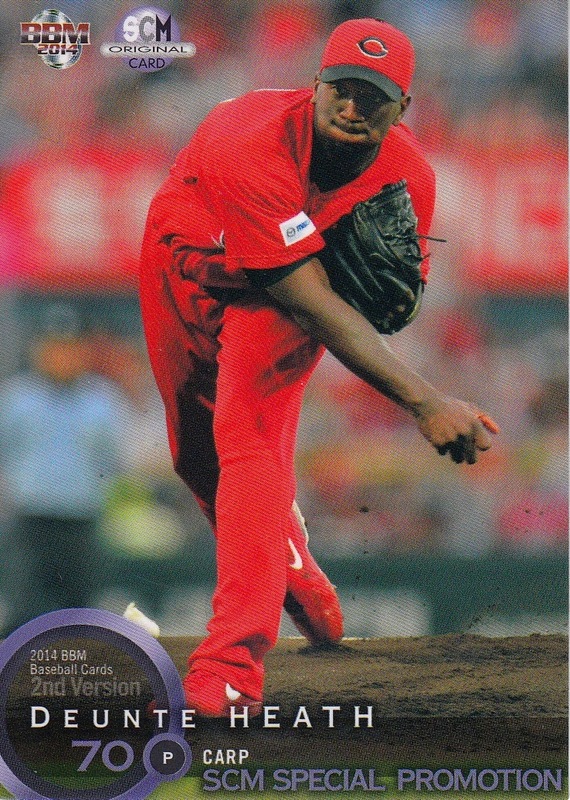 Once again, the latest issue of Sports Card Magazine (#107) has hit the street and once again through the magic of Amazon Japan and DHL shipping, I have my copy just a few days after it was in stores. 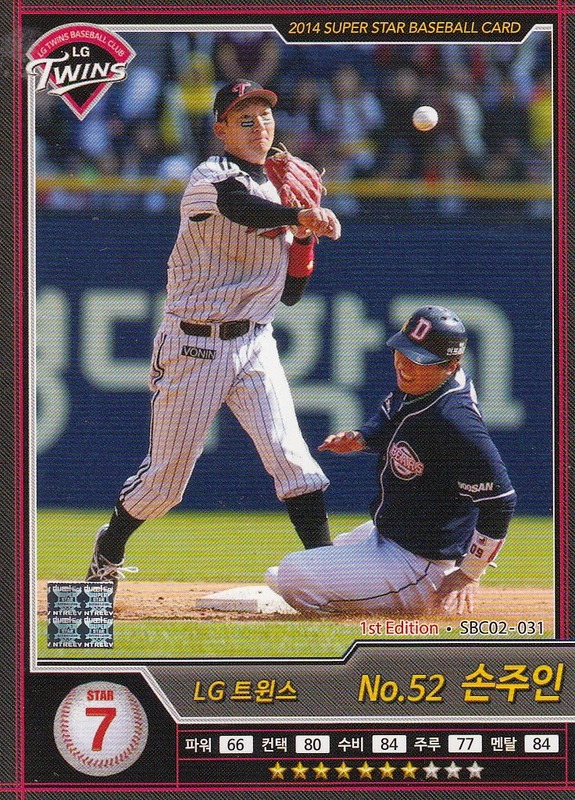 As always there are checklists for the latest issues, and price guides for the 2014 cards. SCM features vintage checklists on a rotating basis - this issue has soccer cards. 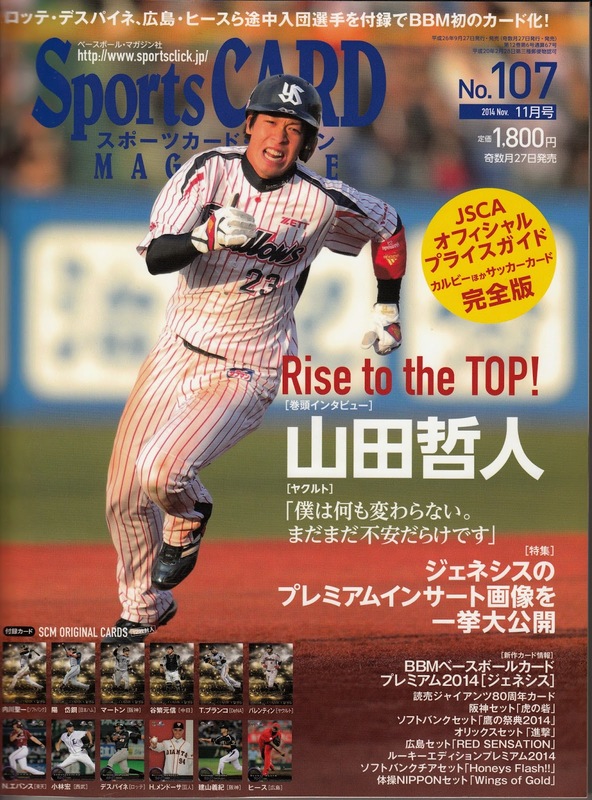 The best part of the magazine, of course, is the included baseball cards. Once again the magazine included 12 cards. Once again, six of them are the Cosmic Cross cards - that makes 30 of them. The final six will be in the next issue that will be out at the end of November. For the other six, SCM decided to repeat what they had done in the last issue and printed six bonus 2nd Version set cards for players who were late signing. And when I say, late signing, I really mean it. The deadline for adding players for the season is July 31 of each year. Five of the six players signed after July 21 this year. Two of the six players are Japanese players returning to NPB -Yoshinori Tateyama pitched in the Yankees organization the first part of this season before signing with the Tigers (after previously having played for the Fighters) and Hiroyuki Kobayashi signed with the Lions after spending much of the past two seasons in the independent Baseball Challenge League (he previous played for the Marines and Tigers). 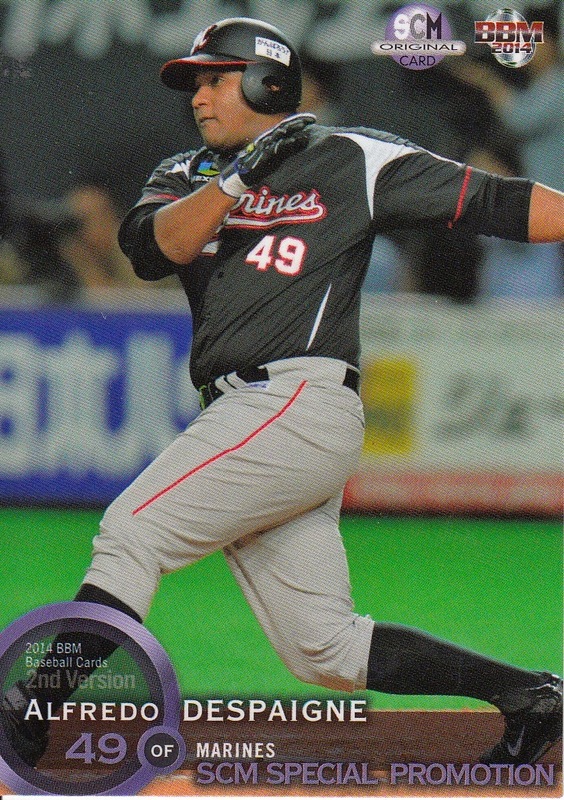 The other four are foreign players coming to NPB for the first time and I'm very excited about two of them - Cuban players Alfredo Despaigne (Marines) and Hector Mendoza (Giants). The other two are Nick Evans (Eagles) and Deunte Heath (Carp). I'm fairly confident that these will be the only cards of these players done this season. The Yomiuri Giants clinched the Central League Pennant for the umpteenth time this past week (note that NPB considers the first place team in each league the pennant winner even if that team does not win the Climax Series and represent the league in the Nippon Series). This made me start reflecting about the managerial career of Tatsunori Hara. 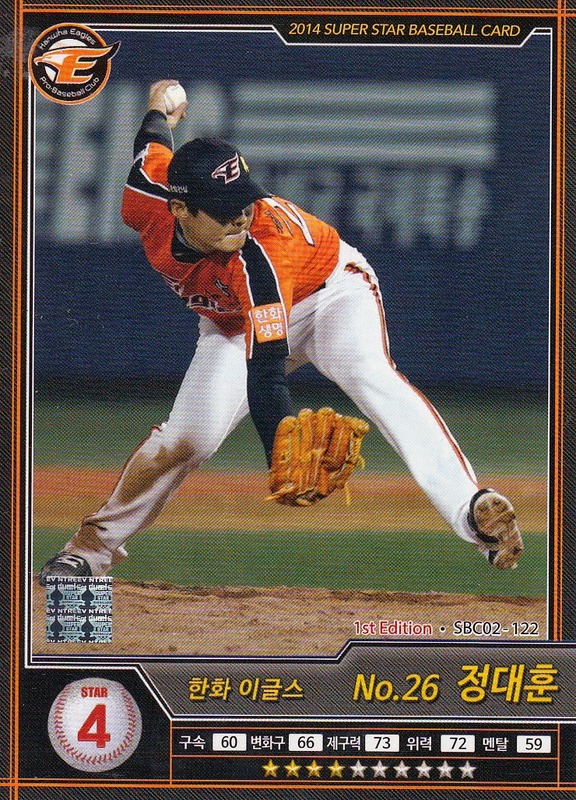 This is the ninth season of Hara's second stint as Giants manager. 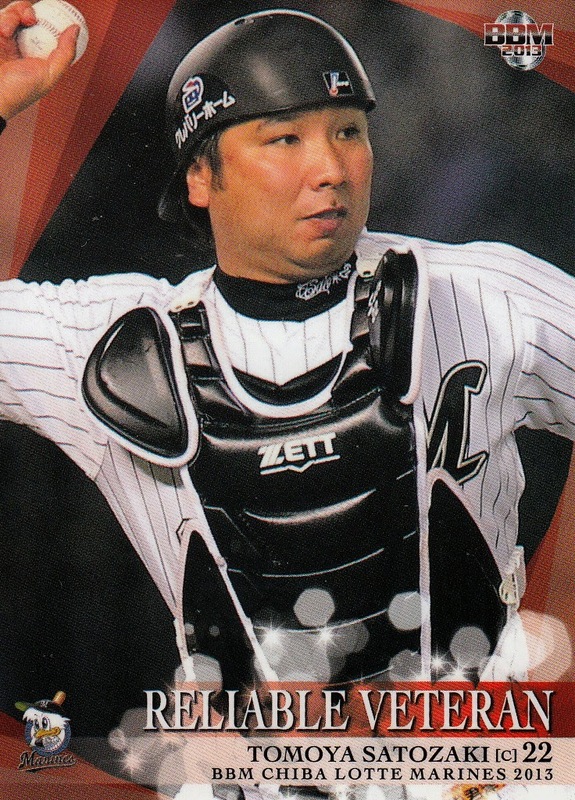 He won the pennant and the Nippon Series in the first year of his first managerial stint (in 2002) but stepped down after the following season when the team was unable to counter the lose of Hideki Matsui and dropped to third. 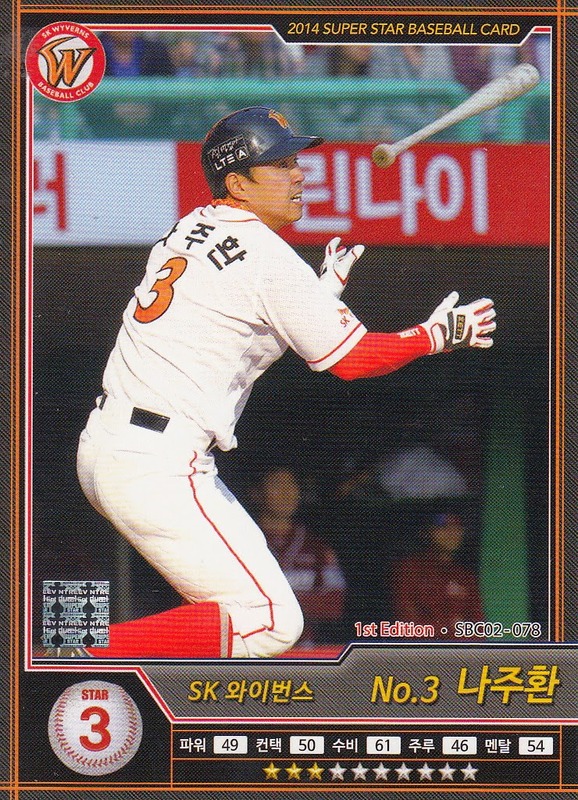 He was rehired after the Giants suffered through two seasons under Tsuneo Horiuchi, finishing third in 2004 and fifth in 2005 (the lowest the team had finished since 1979 and only the third time they'd finished lower than fourth since the two league system started in 1950). 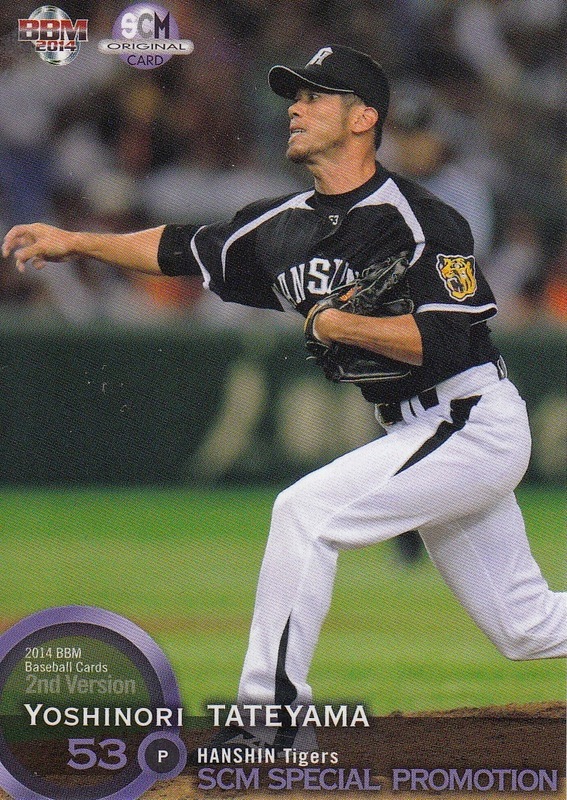 He's won six additional pennants since he returned in 2006 and two Nippon Series championships as well. With this being his eleventh season overall, he is now tied with Shigeru Mizuhara (1950-60) for third most seasons as Giants manager. Shigeo Nagashima managed for 15 years in two stints (1975-1980 and 1993-2001) and Tetsuharu Kawakami managed for 14 years (1961-1974). A couple interesting facts about the Giants - they have not made a mid-season managerial change since 1949, the last season under the one league system and they've never had a manager who played or managed for another team prior to being hired as Giants manager. 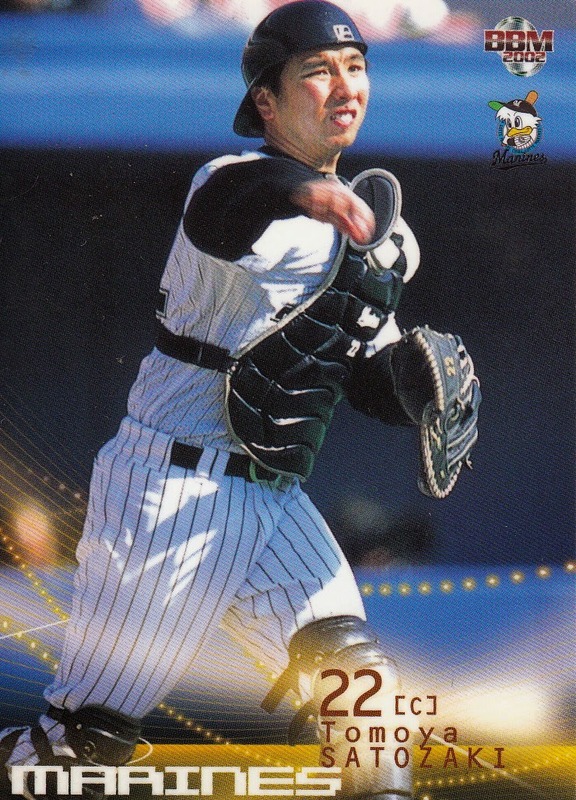 I've wondered lately if Hideki Matsui didn't return to play in Japan with another team (like Hanshin) so that he would not disqualify himself from being Giants manager in the future. 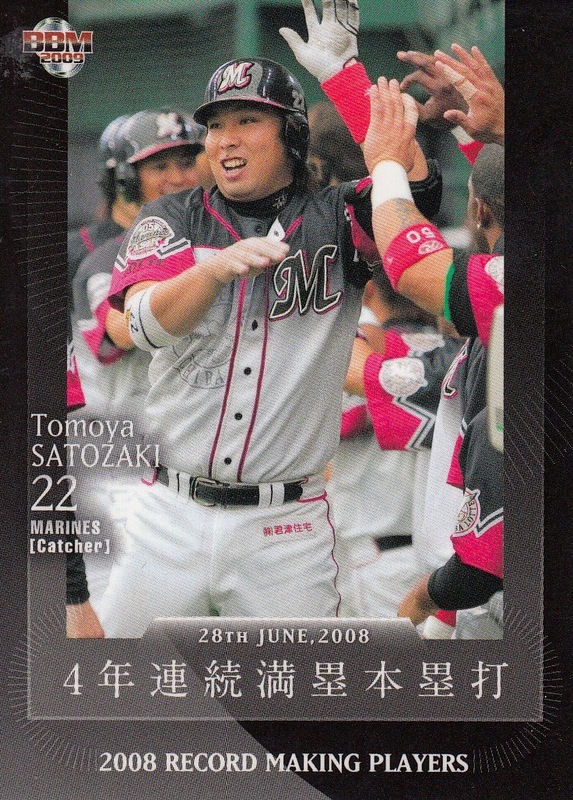 The Marines held a retirement ceremony for catcher Tomoya Satozaki before a packed house in Chiba today. 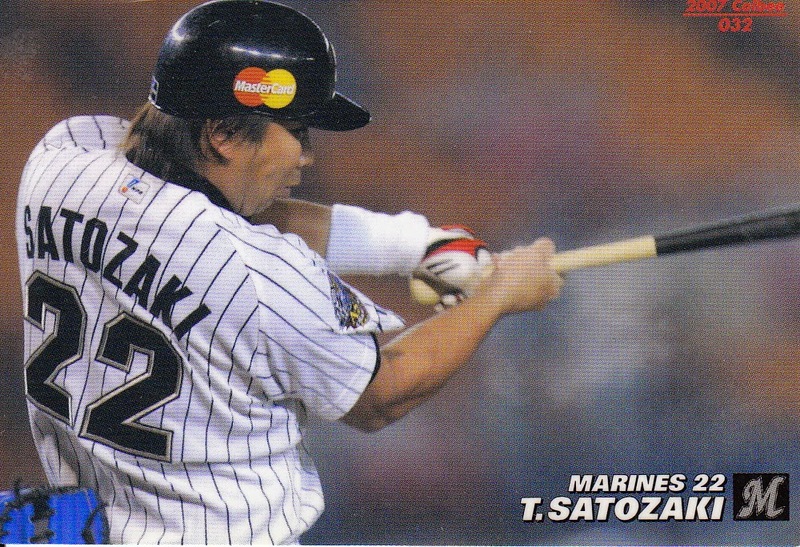 Satozaki was drafted in the second round by the Marines in the fall of 1998. 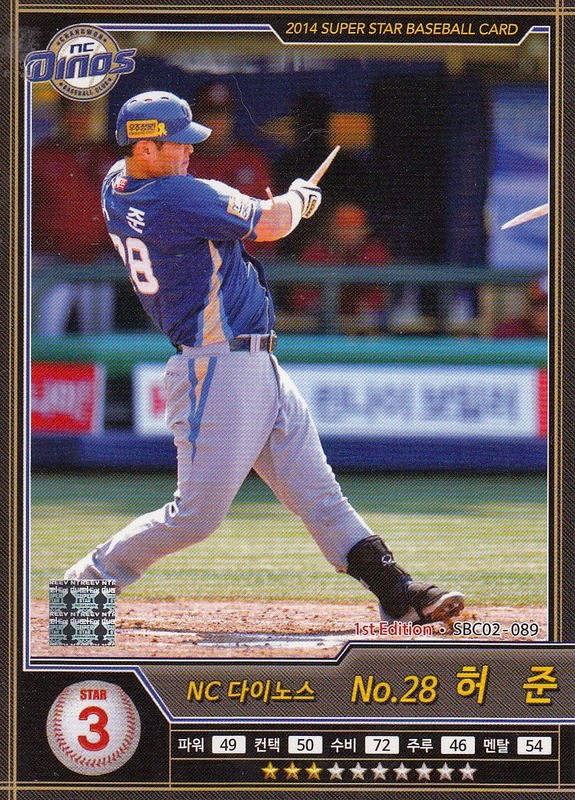 While he played well with the ni-gun team (he was MVP of the 2001 "Fresh All Star" game, the minor league All Star game), he didn't reach ichi-gun to stay until 2003. 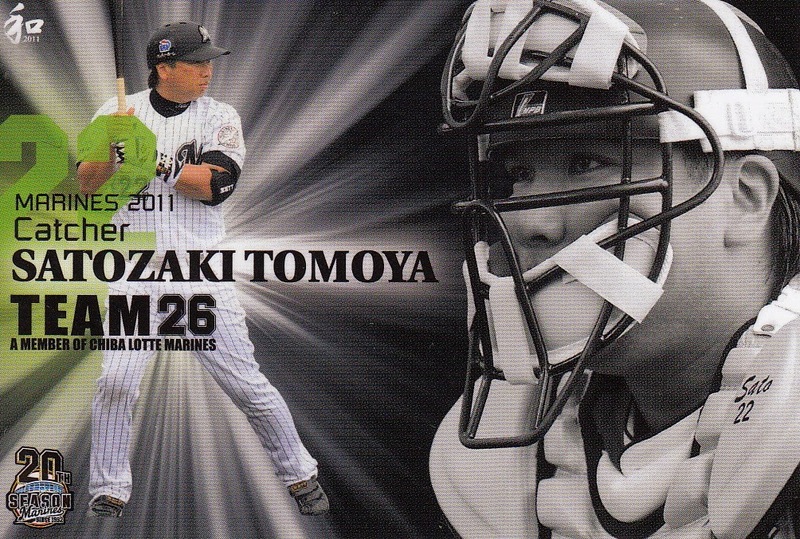 He became the regular catcher for the Marines around 2006 and was named team captain in 2007. Injuries and age started taking their toll on him (he was 30 when he became the regular catcher) and his playing time had diminished quite a bit in the past two seasons. He appeared in the "Record Making Players" subset in the 2009 BBM 1st Version set, but I have been unable to determine just what the record he set was. I was planning on watching the ceremony this morning but apparently win24TV had other ideas - they dropped the feed as soon as the game ended. Luckily, PL-TV has a number of videos of today's retirement ceremony. This is the main ceremony itself. Here's his victory lap around the field. This one shows the career highlight reel that played on the scoreboard. 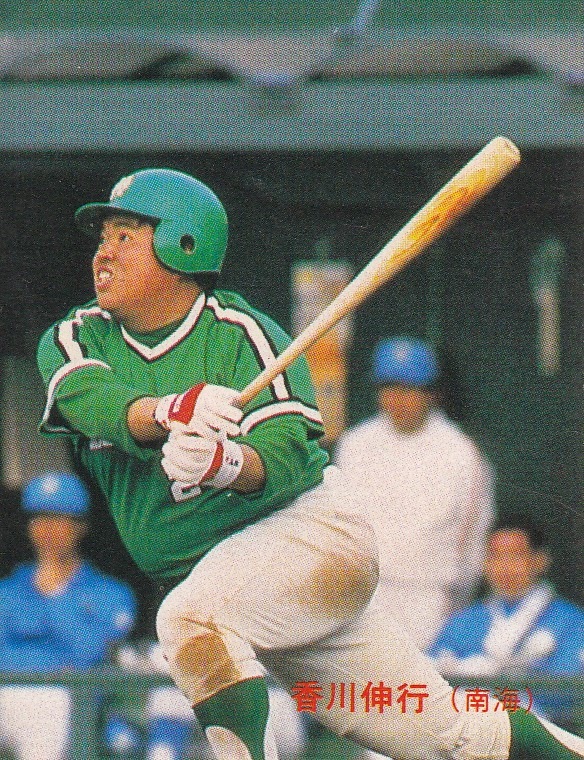 Sad news out of Fukuoka yesterday - former Nankai Hawk Nobuyuki Kagawa has died from a heart attack at the age of 52. Kagawa was notable throughout his career for being overweight and apparently was suffering from diabetes as well as having a heart condition. 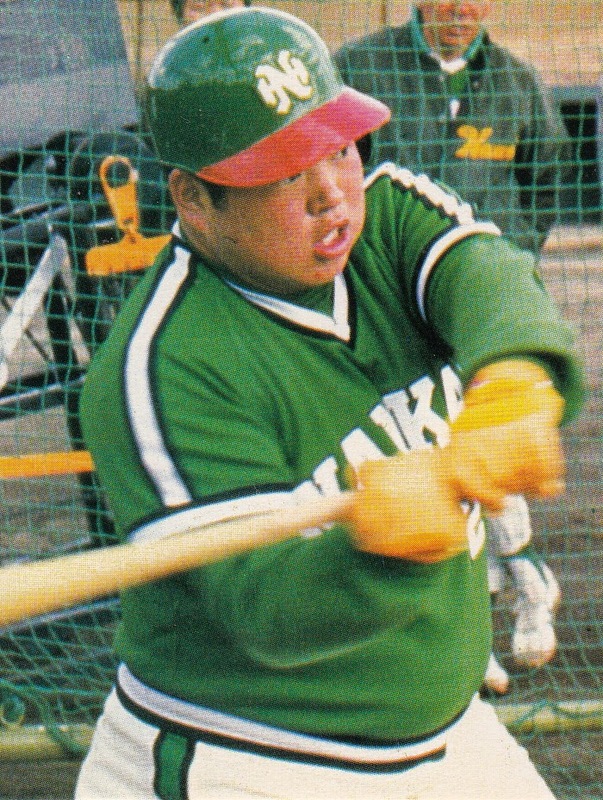 Kagawa attended Naniwa Shogyo High School in Osaka and was drafted by his hometown Hawks in the fall of 1979. Looking at the Hawks fielding stats during his career, it looks like he was mostly a backup catcher - another player had more games catching for the Hawks for every year except 1983 and 1985. 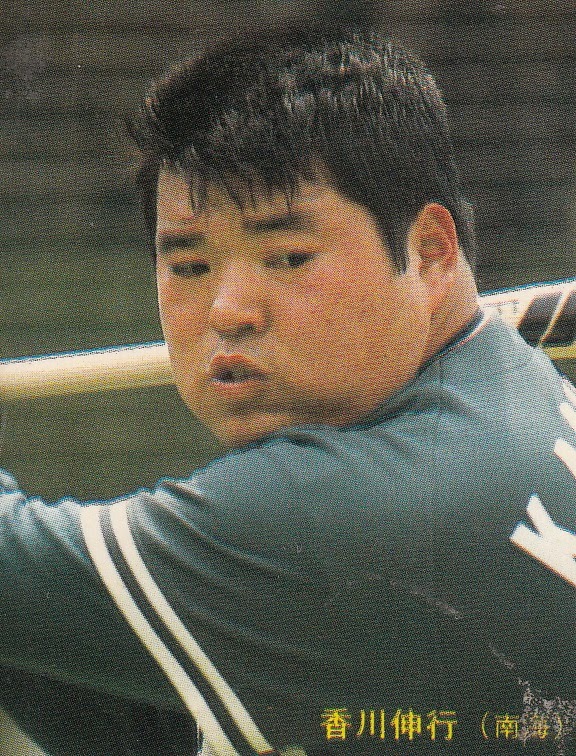 1983 was clearly Kagawa's best season - he hit .313 with 15 home runs. He was named to the Pacific League's Best Nine and made the All Star team that year. He also made the All Star team in 1984 despite the fact that his batting average plummeted almost 100 points to .215. 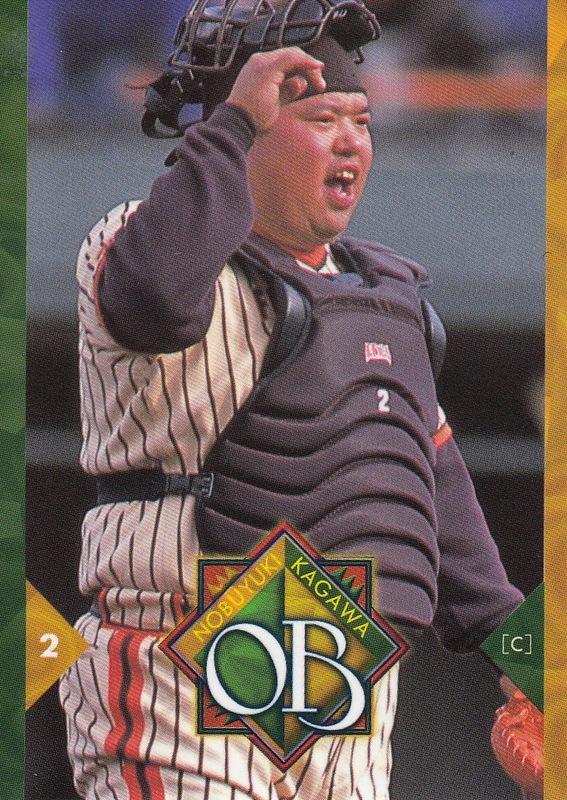 From what I can gather from the translation of his Japanese Wikipedia page, his weight was an issue throughout his career. 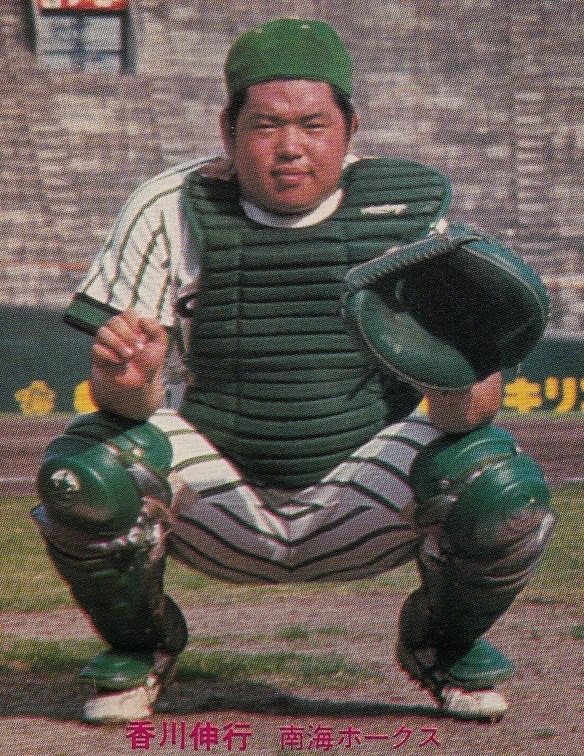 His height and weight in his rookie year of 1980 was 5'7" and 216 pounds but (again referencing his Japanese Wikipedia page) he was popular enough that "he did not refuse the invitation of the meal from the parties". His weight reportedly ballooned to 286 and ultimately led to his release by the Hawks after the 1989 season. At 27, he was done as a player. 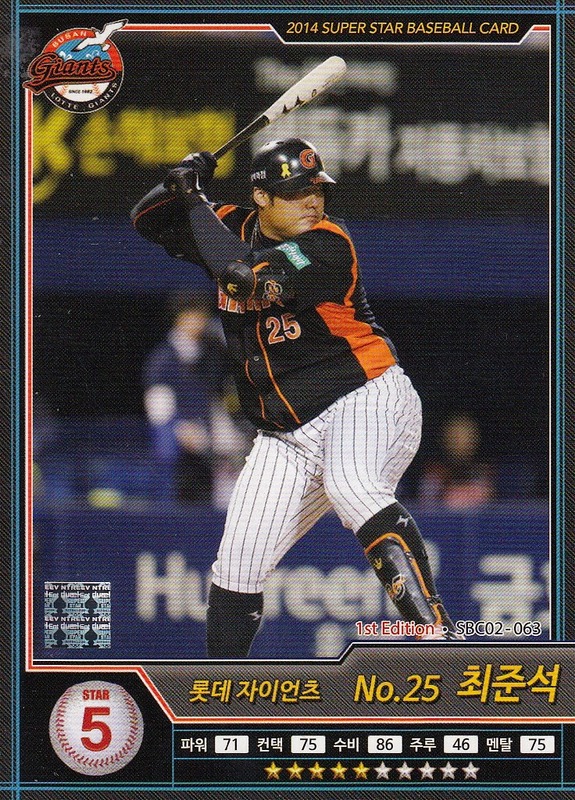 Here's some cards from during his career where you can see the weight gain. Kagawa only played one season with the Hawks after they moved to Fukuoka after the 1988 season. 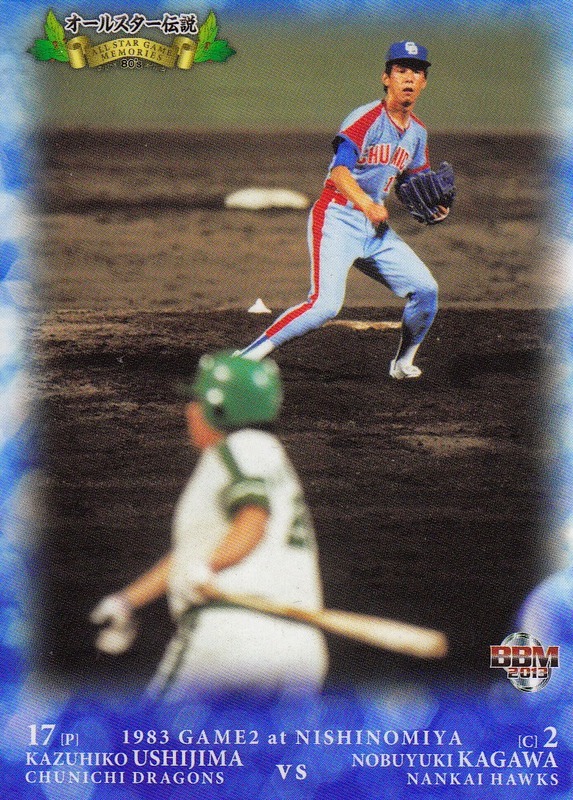 There are almost no cards that I'm aware of that show him with the Fukuoka Daiei Hawks - a card from the 1989 Takara Hawks set and the above card from the 1998 BBM Hawks box set set that had a subset celebrating the 10th Anniversary of the move from Osaka. 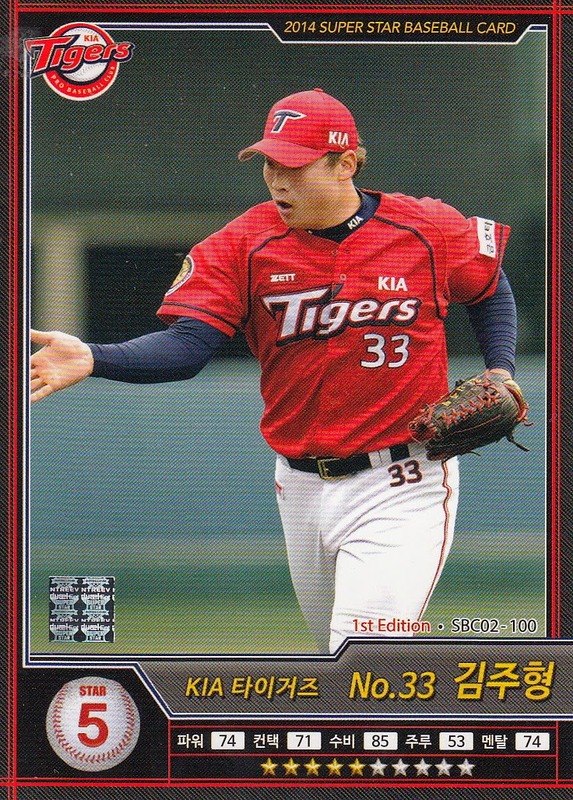 I had ordered a box of the new KBO Super Star Baseball set from someone in Korea on Ebay. I paid for the cards on the sixth but the seller didn't send the cards until the tenth. The post office attempted to deliver them on Monday when no one was home so it wasn't until yesterday that I actually got my hands on them which means it took less than two weeks to get the cards. Like Series One, Series Two features 126 cards in the base set. Unlike Series One, however, none of the base set cards are short prints. Instead, there's a number of parallel issues of certain cards. I'm not entirely sure how many cards have parallels but I do know that there are three kinds of parallels - All Star, Big Star and Super Star. I think that there's a similar breakdown in the parallels as the short prints in the Series One - each team has three All Star parallels, two Big Star parallels and one Super Star parallel but I could be wrong. With the exception of the two duplicate All Star parallels, I was pretty happy with how this box turned out. While I'm still roughly 50 cards short of a complete set, I didn't feel like I was inundated with duplicate cards like I did with the two boxes I opened from the first set. The cards are not numbered in continuation of the first set. They are numbered 1-126. However, the full card number has an "SBC02" prefix while cards in the original set had an "SBC01" prefix. There are no players who appear in both sets. 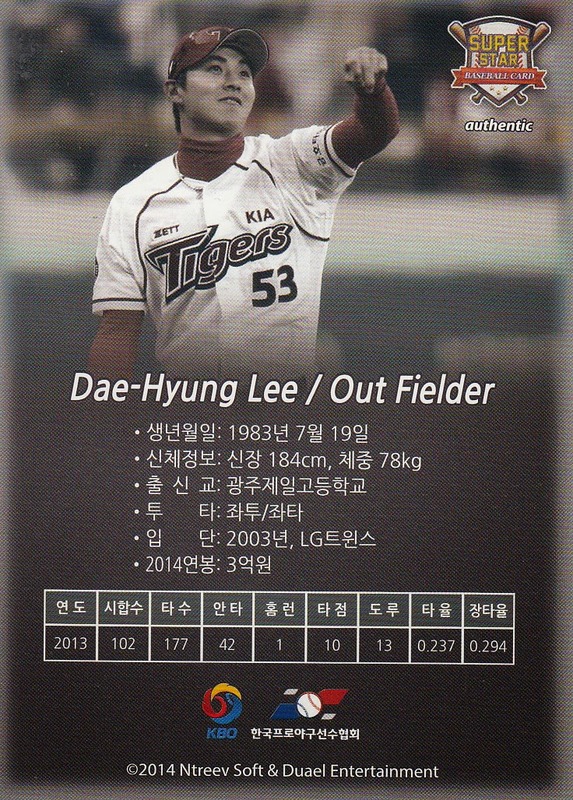 I'm amused that at least one of the Doosan Bears players was depicted in a "turn-back-the-clock" uniform. 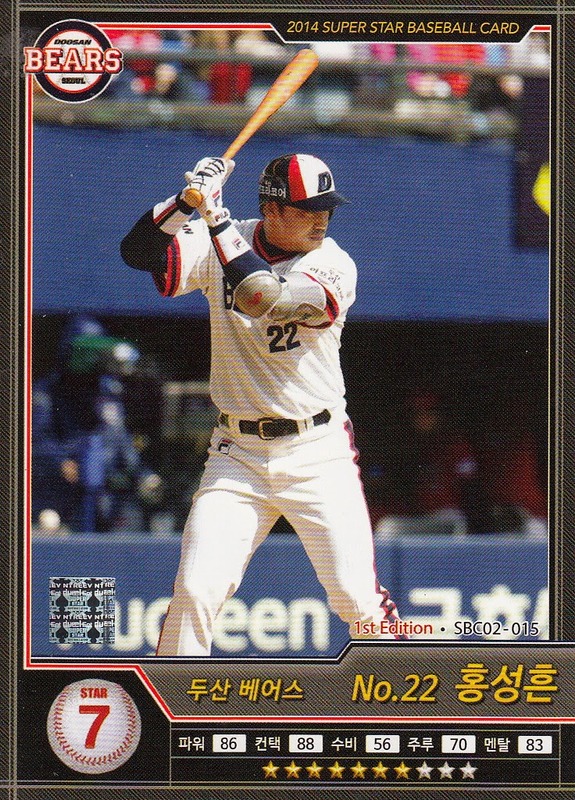 You've probably already noticed that the "Big Star" cards are the only ones with the player's name in English on the front. The backs of all the parallel cards have the same design which contains the player's name in English as well. 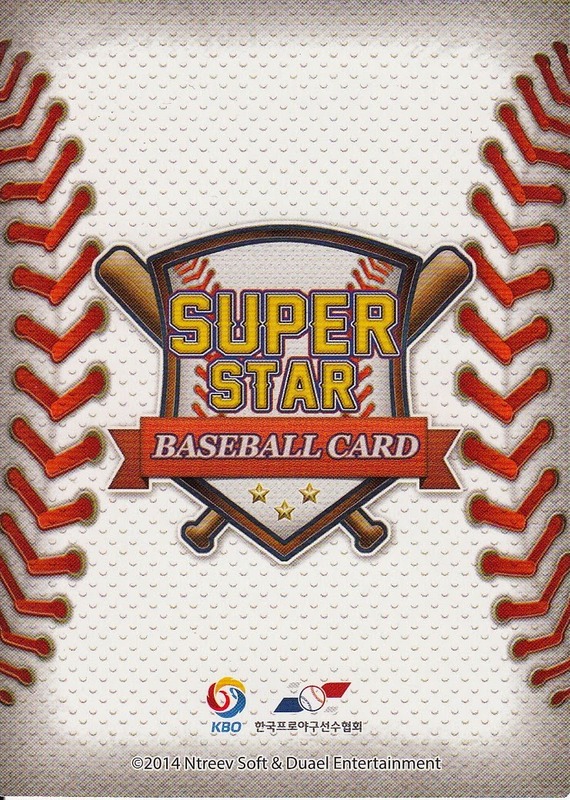 Interestingly, the backs of the parallels have an identical design to the All Star short print cards from the First Series. In addition to the six cards, each pack contained some sort of "item" card. 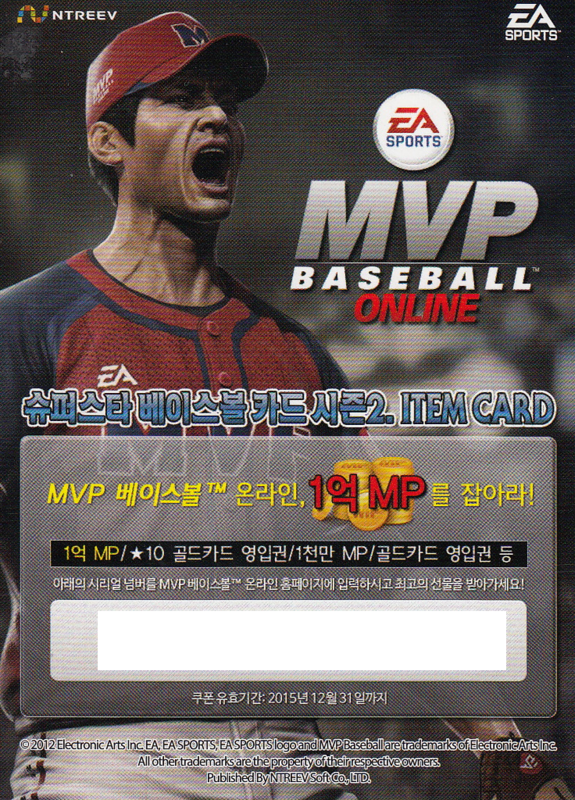 All the ones I got had some sort of on-line code to be used somehow, possibly in the EA Sports MVP Baseball Online game. There are possible autograph and memorabilia cards associated with the set but I don't know if they actually are included in boxes or if you have to pull a redemption card of some sort for them. 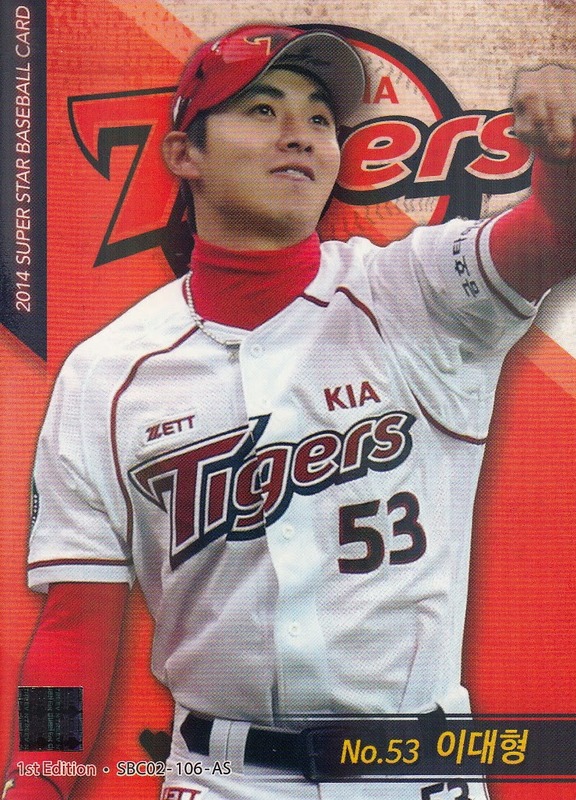 It'll be interesting to see if Super Star does a third set, given that the KBO's season is just about over. It would be nice to see one with some foreign players. Thanks to Jason for adding this set (and many others) to the Inventory Manager over at SportsCardForum.com. 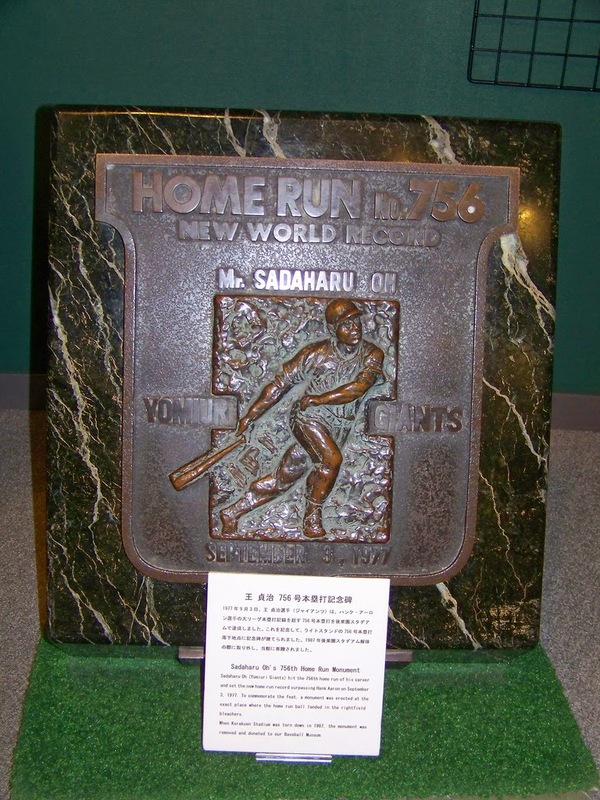 This plaque had actually marked the spot in the right field stands at Korakuen Stadium where Oh's 756th home run (which put him past Henry Aaron) landed. Of course, if I had noticed that there was an English translation on the display card in the Hall Of Fame, I would have known that - jet lag is a terrible thing (although I have no excuse for not having noticed this since I got home). 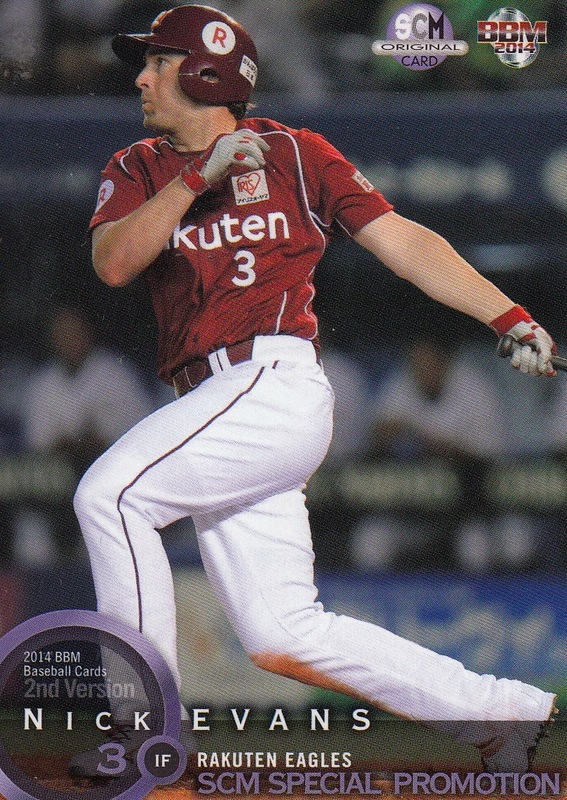 This is from the 2007 BBM Home Run Chronicle set, a box set containing the top 45 home run hitters (at the time of course) in NPB history. Oh's card is, of course, #01. 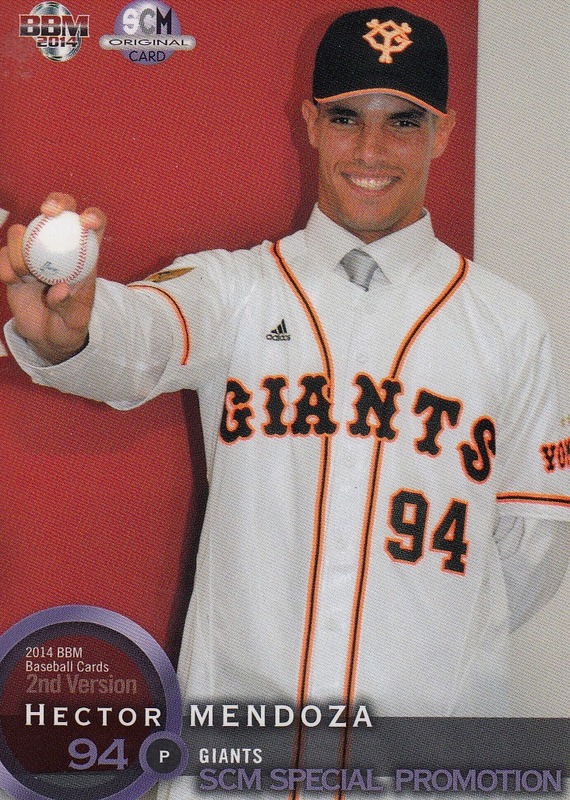 - Pretty much as expected, BBM is doing an 80th Anniversary set for the Giants. This will be a pack based set with 99 cards in the base set, a 12 card insert set and assorted autograph cards. 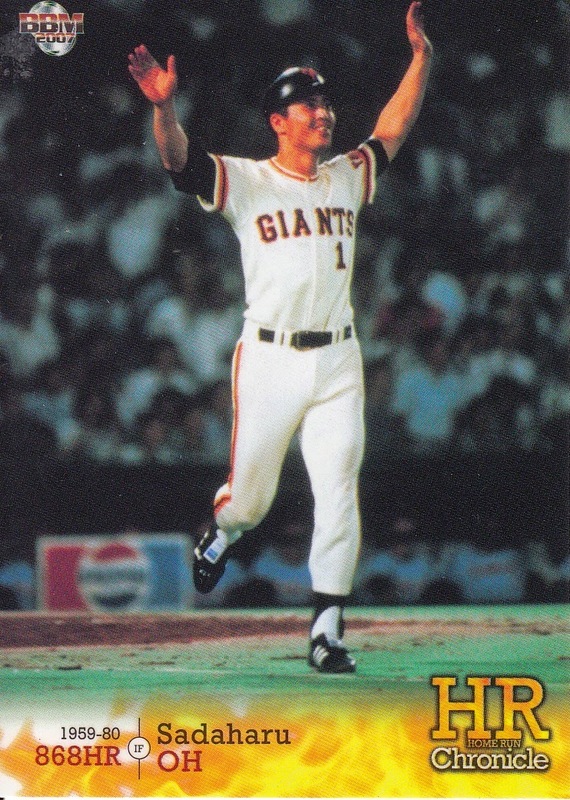 The 99 cards in the base set will divided into four subsets - six cards for "History Of Giants", 69 cards of OB Giants, 15 cards for the current team and nine cards for Giants team records. The insert set is called "Giants Heroes". 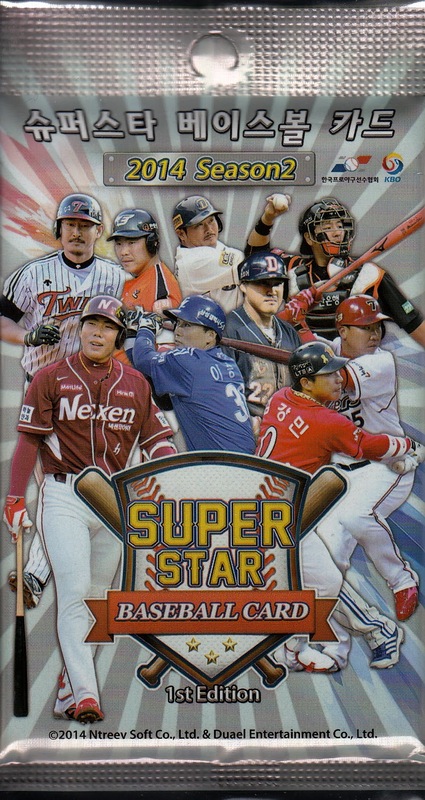 I'll be curious to see if the two most noticeably absent players from the 70th Anniversary set (Masaichi Kaneda and Wally Yonamine) are included this time. I think the set will be out in late October. - Front Runner has announced two more team based box sets. They are continuing their "Signature Edition" box sets that they had previously done for the Buffaloes and Lions with one for the Baystars. 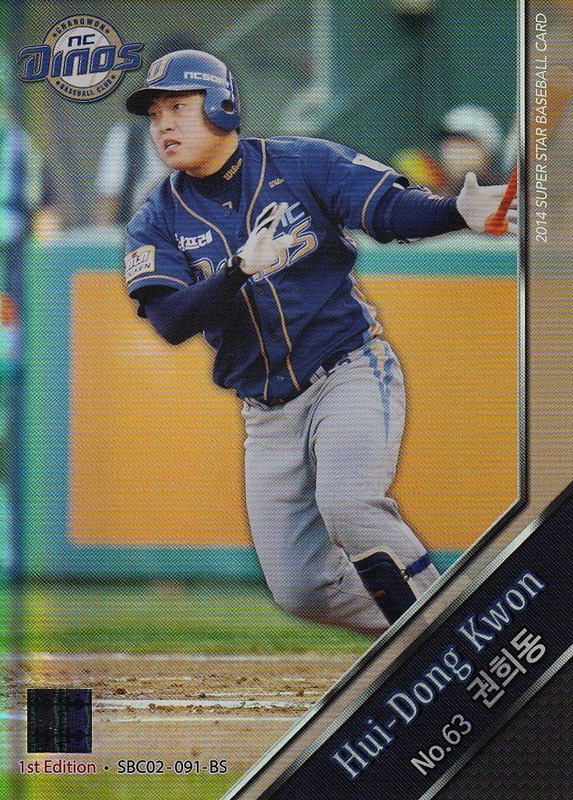 Like the previous sets, the new set will include 22 cards - 20 cards for the base set and (I think) two autographed cards. One of the more interesting things about the autographs is that I think Yulieski Gourriel is one of the players who signed for the set. I'm not sure if any of the Cuban players have been available on an autographed card before. The other set is for the Carp and has some sort of promotional thing going on with Mizuno. I think the set is called something like "Hiroshima Toyo Carp X Mizuno". It's the smallest set that Front Runner has done so far - 17 cards with 15 of those cards making up the base set and the other two cards being potentially autographed and jersey cards. I'm not positive but I think that each box has one autograph card and one jersey card in it. It looks like the press run for the set is limited to 1000 - I'm not sure what the runs have been on Front Runner's previous sets but I suspect that they were more like 5000. Both of these sets will be released in October. CORRECTION - looking at some of Ryan's posts about Front Runner/Frontier's box sets, it looks like their standard print runs are in the 1000-1500 range, so the Carp sets print run will be in line with what they've done before. 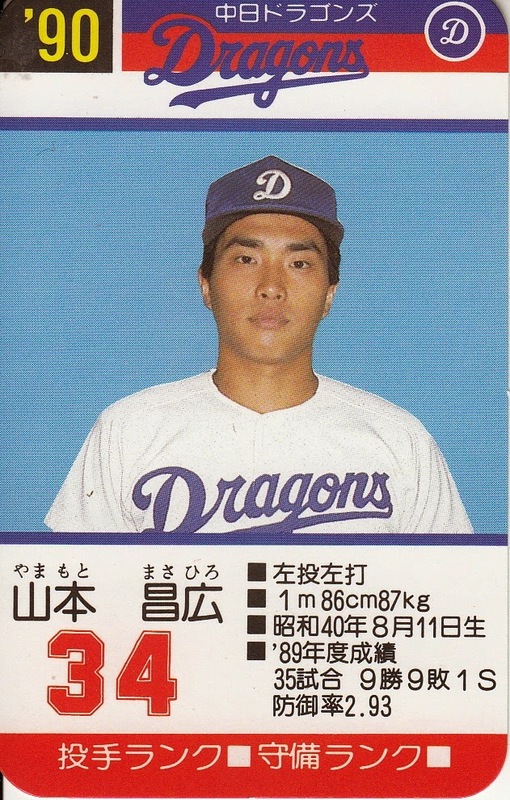 On Friday Masahiro Yamamoto of the Dragons became the oldest pitcher to win a game in Japan. At 49 years and 25 days, he also set records for the oldest pitcher to appear in a game, start a game and get a strikeout. Obviously Yamamoto has been around forever. He was taken in the fifth round of the 1984 draft (held in November of 1983) by the Dragons. 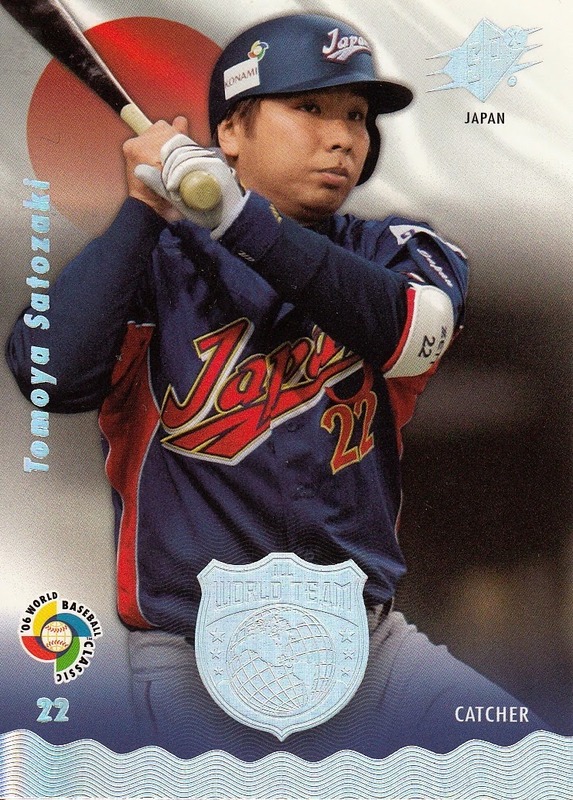 It looks like his first Japanese card is from the 1989 Takara Dragons set. 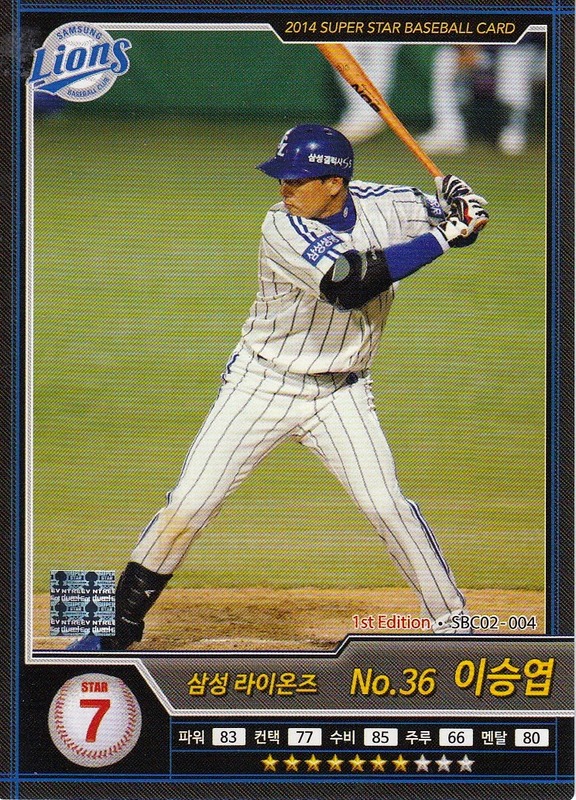 His first Calbee card was #64 from the 1990 Calbee set and his first BBM card was #67 in their inaugural set in 1991. 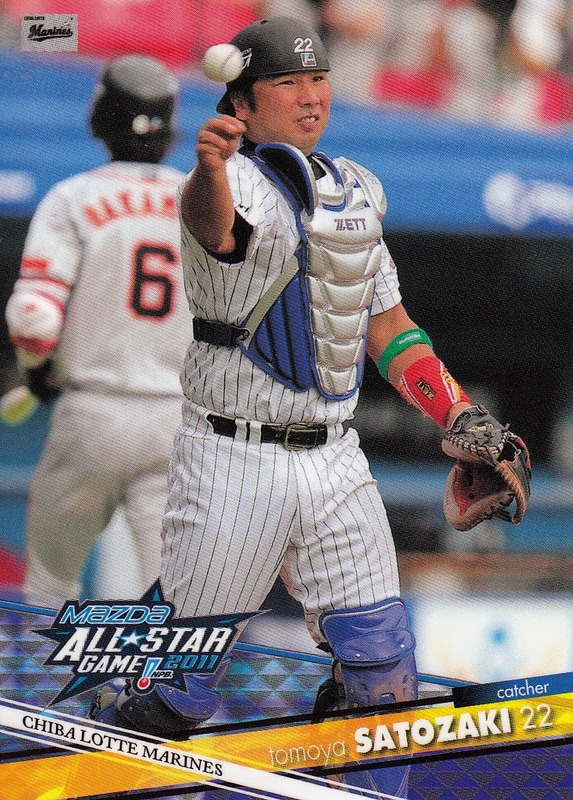 Yamamoto is one of only two players (Motonobu Tanishige being the other) who has appeared in at least one of BBM's flagship sets every year that BBM has done cards (1991-present). One interesting thing about his cards - he actually had cards in the US before he had cards in Japan. Yamamoto spent the 1988 season playing for the Vero Beach Dodgers of the Florida State League. 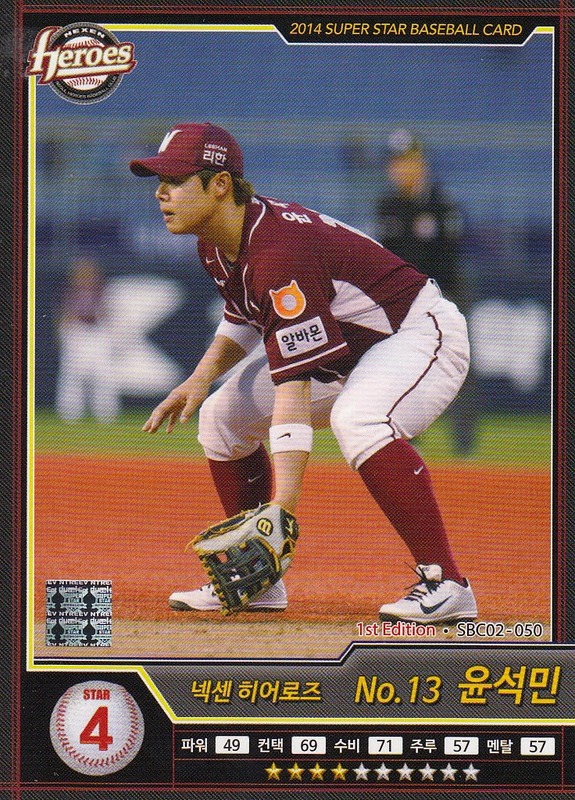 He appeared in both the Star team set for Vero Beach and the Florida State League All Star set (also by Star). The records that Yamamoto broke were all set by Hall Of Famer Shinji Hamazaki. Hamazaki had a very odd career. After a fairly long career in the industrial leagues, he joined the Hankyu Braves in 1947 (at age 45) and became their player manager. He managed the team until 1953, still pitching for them in 1948 and 1950. 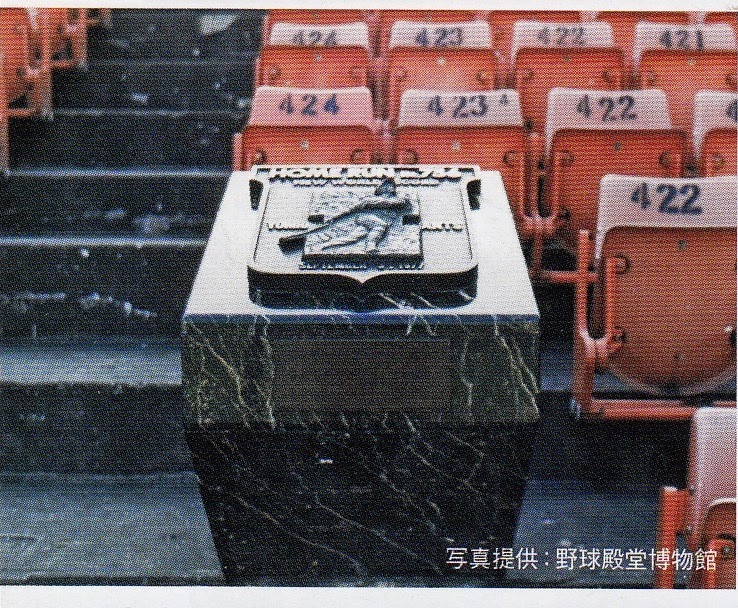 He also managed the Takahashi/Tombo Unions in 1954 and 1955 and the Kokutetsu Swallows in 1963. He was reportedly one of the shortest players ever, standing only 5' 1.5". 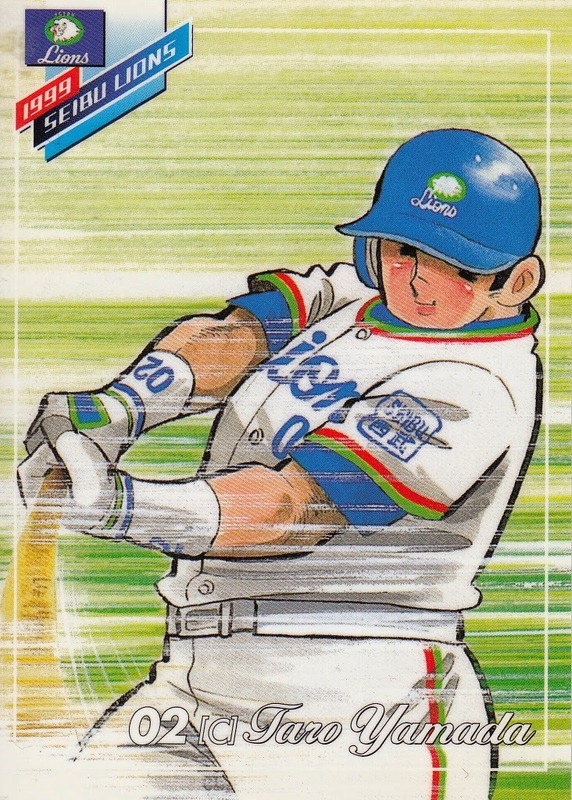 While he appeared on a handful of menko and bromide cards while he was active, Hamazaki does not appear to have any modern cards. 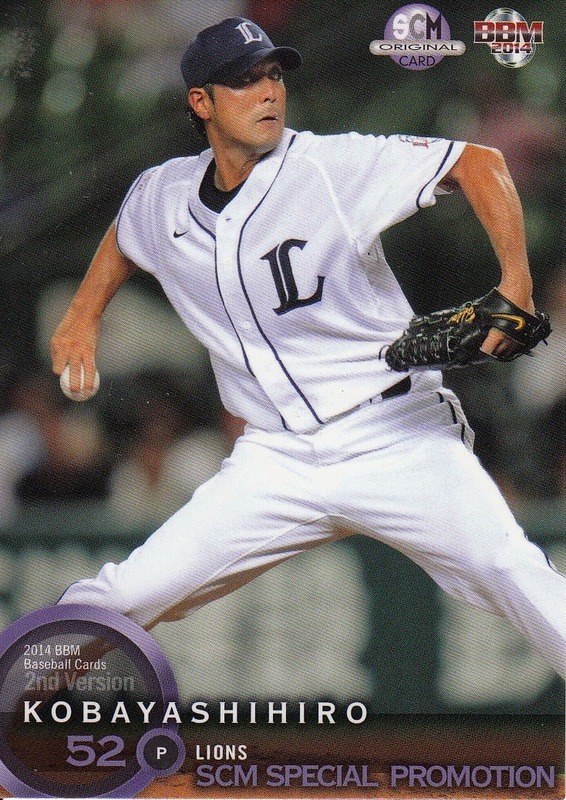 He's not in any of the logical BBM sets that he could have appeared in - 2006 Nostalgic Baseball, 2009 Hankyu Memorial or the 2011 Legend Of The Tokyo Big Six (he attended Keio University in the 20's). 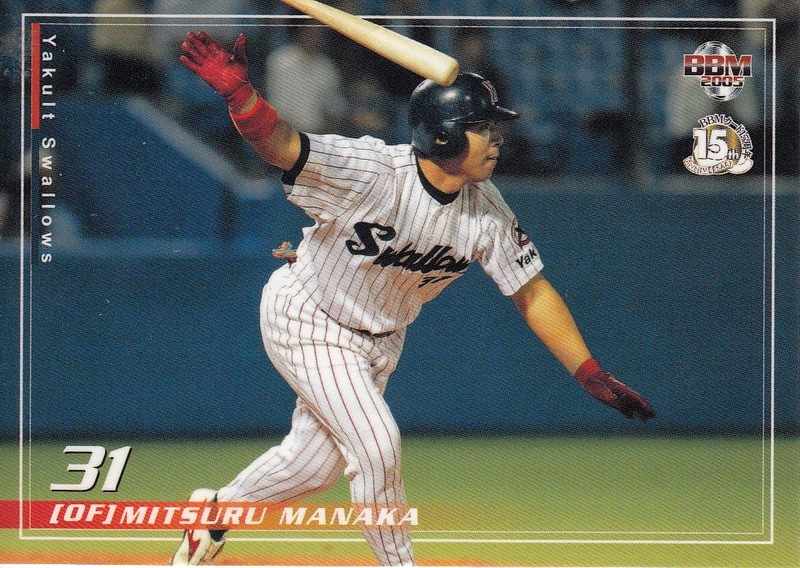 He ranks up there with Shigeru Makino as one of the toughest Japanese Hall Of Famers to get a card of. 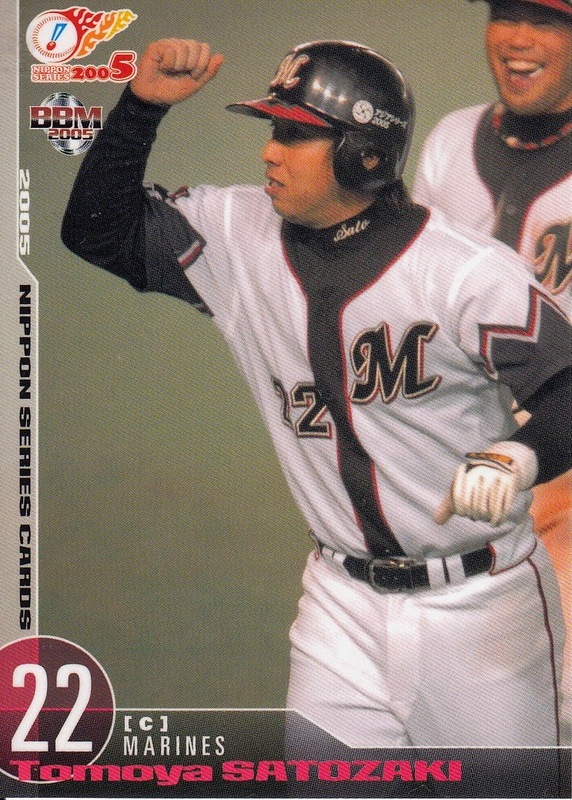 There will be an "Ask Me Anything" with former Nankai Hawk and Chunichi Dragon Carlton Handa this weekend on the NPB Reddit page. It is scheduled for 11 AM Japan time on Monday September 8. This will be Sunday evening in the US - 10 PM on the East coast and 7 PM on the West coast. Handa was born in Hawaii and attended the University of Houston. He played for the Hawks from 1958 to 1961 and spent 1962 with the Dragons. 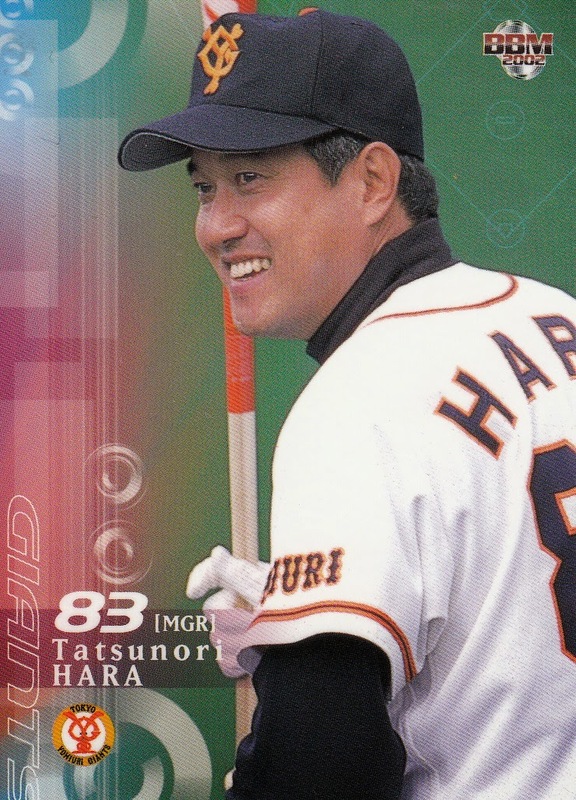 He went by the name "Haruo" when he played in Japan - I'm guessing someone will ask him why next week. I'm not sure how many other cards he had. 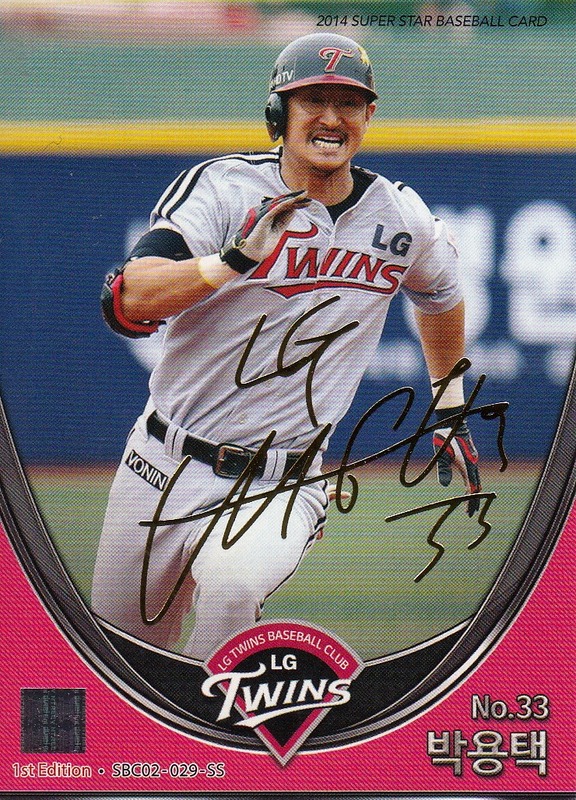 He's had at least one menko card and one bromide card. He does not appear in any of BBM's historic sets. 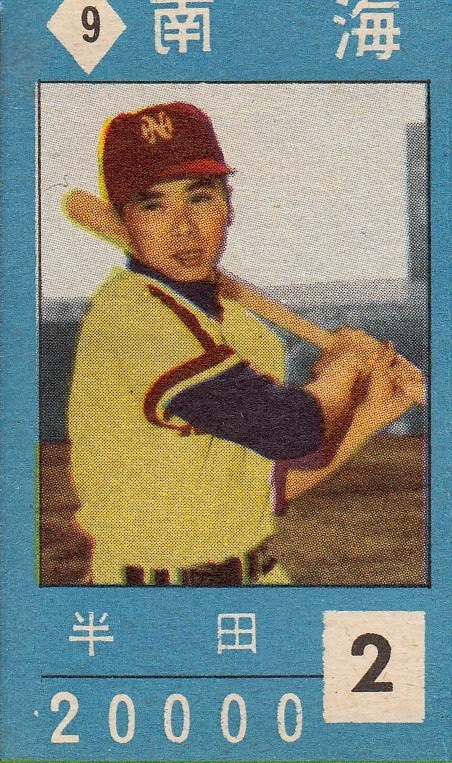 It'd be nice sometime if BBM did a set that included some of the nisei players who played in NPB in the 50's like Handa, Wally Yonamine, Andy Miyamoto, and Satoshi "Fibber" Hiyama.